Grafitti is not the first thing that comes to mind when thinking about Marrakech but it is becoming a backdrop in some areas both inside and outside the medina. The city actually commissioned street art on its streets for the first time in 2016 as part of the 6th Marrakech Biennale. 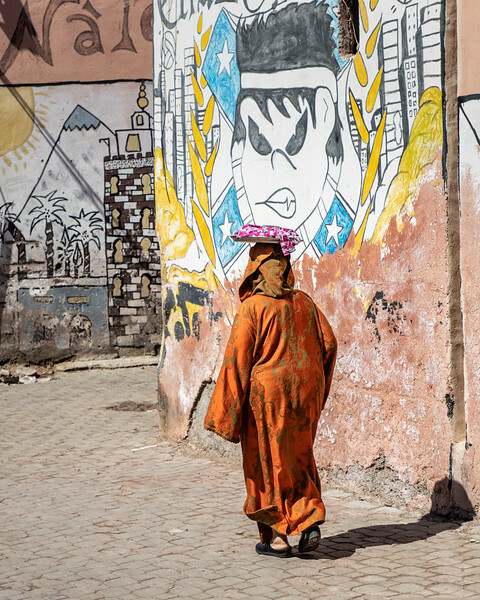 This is an interesting juxtaposition of a women in her traditional djellaba and headscarf, probably coming from the local communal bakery, with modern graffiti from local artists providing a colorful background. Note the tanned leather hanging on the walls to dry.